There are many more available. Just google "free hex editor". I'll be using Free Hex Editor Neo for this tutorial as it's Windows based. 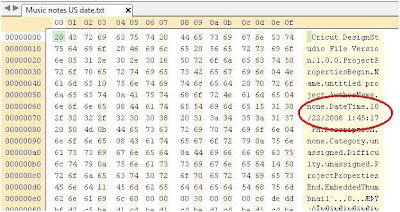 Start your hex editor software. In this example the date is in mm/dd/yyyy format - 10/22/2008. We'll change it to the dd/mm/yyyy format - 22/10/2008. It doesn't matter what date you put here, so long as it's in the correct format for your part of the world (or how you have set the date regional settings on your computer). We're going to change the 22 to a 10. That way the date will read 10/10/2008 - acceptable for everyone's computer. I save all the files I share in this way. I just make sure the month and day are the same number eg. 10/10/2008, 02/02/2008. I also change the year if necessary so that the actual date has occured. Not sure if that's necessary, but I do it anyway. Click on the first 2 in 22. The parts you have changed will turn red. Now the important part. You need to save the changes to this file. You can give the file a new name if you like, which means your original file will still be intact, or give it the same name, which means it will overwrite the original file. We'll give it the same name. The Saved As Type will stay as "All Files"
If you forgot to save the file you will be prompted at this stage to do so. You will be asked if you want to save both files. You can say No to the original file but make sure you save the amended file. Now you can go back to Design Studio (it should be open by now) and open your file.